Members of the Sawtooth Pony Club in Bellevue proved to be successful at a regional Eventing Rally competition held on July 21-22 at Rafter K, a premier equestrian facility south of Bellevue. The second place overall team award was earned by the Sawtooth Pony Club team consisting of Giovanna Leslie, Carmen Leslie, Willa Laski, Will Englehardt and Scout Hutchinson. The Sawtooth Pony Club team also earned 3rd place in Horse Management. Individual awards went to Leslie and Hutchinson. Leslie got 1st place in her division, and Hutchinson got 2nd place in her division. Augusta Catherin, a Sawtooth Pony Club member, was an assistant judge at the competition and other members, Haley Cooper and Payton McCune, participated by volunteering countless house in the preceding week to help prepare the facility for the rally. 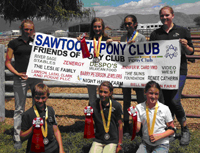 The Sawtooth Pony Club is just one of over 600 clubs across the country. Its members, ranging in age from 8 to 17, regularly participate in local, regional and national Pony Club activities. Along with an emphasis on helping members learn to ride and care for horses, Pony Club promotes teamwork, a sense of responsibility, safety, good moral judgment, and self-confidence.